The 5-8 Club’s award-winning juicy lucy is the best in town! Our half pound patties are filled with cheese and grilled to perfection for a taste you’ll never forget! A Juicy Lucy from the 5-8 Club, Minneapolis’ “Home of the Juicy Lucy”, is a special kind of Midwestern treat. Our half pound Juicy patties are stuffed full of cheese and then grilled to a sizzle on a flat top. To top it off, we serve our cheesy creation on bakery fresh buns, made daily. Finally, we throw some pickles on there as a finishing touch. Enjoy! And remember, be careful & take your time – the cheese is HOT! Our signature item, the Juicy Lucy, has transformed the way America sees cheeseburgers. Featured on several syndicated national TV shows, our burger stuffed with cheese has gained national attention. 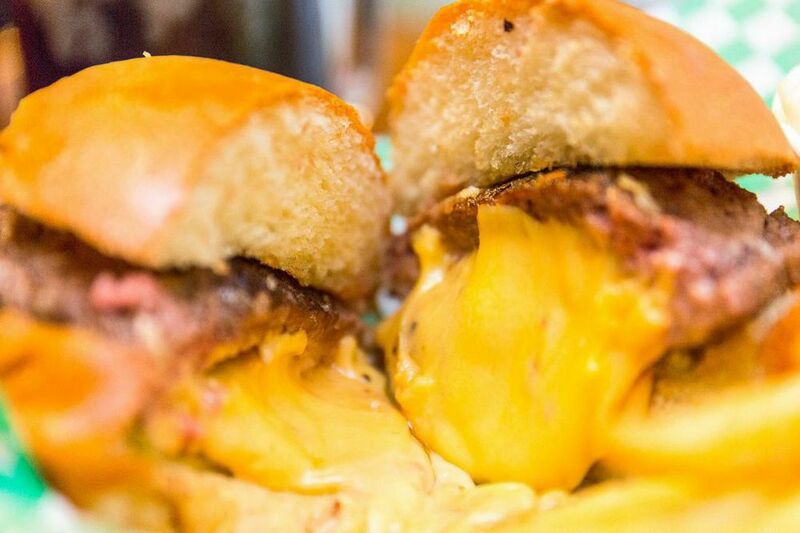 Adam Richman’s Man v. Food put our Juicy Lucy on the culinary map. In 2014, the Travel Channel ranked the 5-8 #1 in America for tastiest place to chow down. Time Magazine also listed the Juicy Lucy as one of the most influential burgers of all time. City Pages listed eating a Juicy Lucy at the 5-8 as #15 on its comprehensive Twin Cities bucket list, “50 Things To Do Before You Die.” These honors would not be possible without our loyal Juicy Lucy fans! Thank you for helping us achieve recognition as the best Juicy Lucy restaurant in the Twin Cities.